The primary purpose of pressure regulators is to control pressure with close tolerances to ensure that compressed air in a pneumatic system is not wasted. Pressure regulating valves accomplish this by maintaining constant output pressure under various input pressures and output flows. Pressure regulators are used for various home, medical and industrial applications such as home furnaces, tanks for oxygen and anesthesia gases, and pneumatic automation systems. Pressure regulators are manufactured for a range of fluid, gas and air applications. They are offered in numerous configurations, but all typically contain the same three functional elements: a valve that reduces or restricts pressure, a component that senses pressure and a control element that reduces or restricts pressure. To meet the needs of your pneumatic application, Pneumadyne manufactures relieving pressure regulators, and miniature precision pressure regulators. A variety of porting options are also available for plumbing convenience. Relieving Pressure Regulators are engineered to maintain a constant, preset downstream pressure. Miniature Precision Pressure Regulators provide highly accurate pressure control in a compact package. Request a quote for your pressure regulators today or contact Pneumadyne for more information. 10-32 (F) Input Port Pressure Regulators: Swivel input port with elbow or tree configuration for plumbing. Purposes. Operating pressure of 30 to 125 psi and a flow rate of 22 scfm at 125 psi. 1/8 NPT Input Port Pressure Regulators, Relieving: Features swivel ports for critical valve alignment and an extended gauge port that provides an on-site pressure indicator. Operating pressure of 30 to 125 psi and a flow rate of 22 scfm at 125 psi. 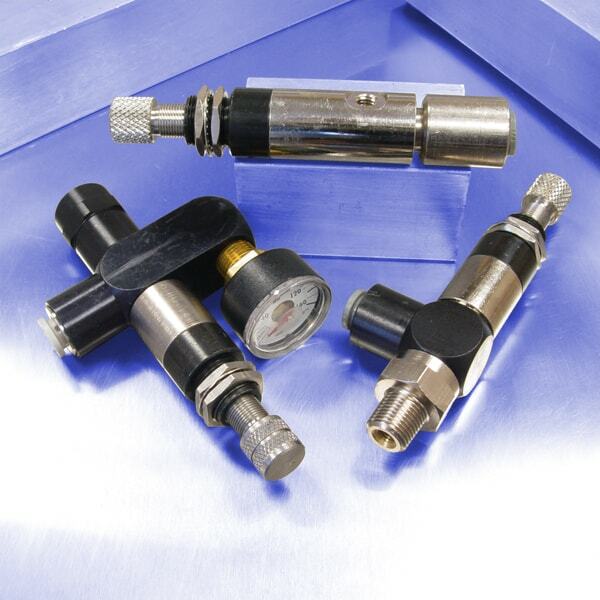 1/8 NPT (F) Input Port Pressure Regulators, Relieving: Features ports that rotate 360° for alignment purposes and push-to-connect ports to ease tubing installation. Operating pressure of 30 to 125 psi and flow rate of 22 scfm at 125 psi. 1/4” Push-In Input Port Pressure Regulators, Relieving: Push-to-connect ports that swivel for easy tubing installation and to ease alignment. Extended gauge port configurations also available. Operating pressure of 30 to 125 psi and flow rate of 22 scfm at 125 psi. 5/32” Push-in Input Port Pressure Regulators: Swivel ports are ideal for critical alignments and push-to-connect ports speed tubing installations. Extended gauge ports and direct gauge mounts available. Operating pressure of 30 to 125 psi and flow rate of 22 scfm at 125 psi. .170 Tube Id Barb Input Port Pressure Regulators: Features barbed input ports that rotate 360 degrees. Operating pressure of 30 to 125 psi and flow rate of 22 scfm at 125 psi. Miniature Precision Regulator: Self-relieving pressure regulator features include compact size, low hysteresis, and .016% repeatability. Operating pressure up to 100 psi and flow rate of 4.5 scfm and 100 psi. Locking Nut: Used to lock pressure regulator adjustment and is ideal for operations requiring infrequent adjustments. Electroless nickel plated to provide corrosion resistance. Pneumadyne is a manufacturer of standard miniature pneumatic valves, pressure regulators, and more. We can also assist you with design and engineering of customized pneumatic components or full pneumatic control systems. Request a quote or contact us today!